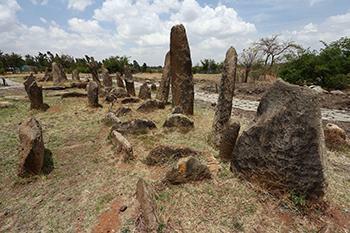 Tiya in southern Ethiopia is an archeological site, which is distinguished by 36 standing stones or stelae. They are marking a large, prehistoric burial complex of an ancient Ethiopian culture. Site visited April 2015. The small and puzzling site of Tiya left me with mixed feelings. For me it was the first taste of Ethiopia and as such it was an exciting journey. But if you are not a WHS or cultural history enthusiast the experience could be underwhelming. Tiya is an early inscription from 1980. Although it is quite near Addis Ababa it is not very easy place to reach. In theory there should be some bus connection but I wouldn’t count on it. In practice the only reasonable way to visit Tiya is to hire a car and a driver which I did via local travel agency. I had arrived in Ethiopia just a few hours earlier. In the morning, after two hours of sleep, the driver picked me up from my hotel. The journey in the countryside south of Addis Ababa was fascinating as we stopped along the route to admire nice views and meet some shepherds of Oromo people. After three hours we arrived in the site of Tiya. There was someone who collected a small entrance fee and also a souvenir seller in a small hut. Besides them I was the only visitor. The site is very small with 36 steles in three clusters. The steles are up to two meters in height and some of them lie on the ground. Almost all the stones have engravings which include swords, circles, false banana trees and some unidentified symbols. There have been different hypotheses about the reason for their existence. Bones have been discovered beneath the steles which might indicate that Tiya is a burial site and the steles are the grave markers of some lost civilization. My driver told that in this area there are almost two hundred same kind of steles. He said that the plan is to gather more stones from the surrounding area and to bring them to this site because there the stones are better taken care of. I don’t know if that is true. Some renovations have been made just before my visit as they had paved the footpaths around the steles. There was also a new museum being built at the time my visit. Usually the tours to Tiya include also visits to Melka Kunture archaeological site and Adadi Maryam church because they are located along the route. Adadi Maryam is the same kind of rock-hewn church than the ones in Lalibela but in much more smaller scale. Unfortunately Melka Kunture site was closed at the time of my visit. Ethiopia is full of remarkable World Heritage Sites but Tiya is not quite in the same class. Spectacular is not the right word for this site. Visiting it is of importance for WHS enthusiasts, like me, but is it as itself worth a long and costly journey - I don’t know. I’m happy that I visited this strange and remote site but I can’t recommend it for everyone. A word commonly used regarding Tiya (including in the UNESCO documentation itself) is “Enigmatic”. 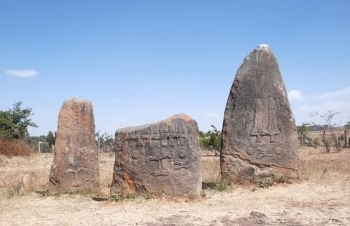 Despite its inscription as long ago as 1980 remarkably little is known about the c35 strangely carved standing stones situated in a 200 metre square site 85 kms outside Addis Ababa. Which group of people created them? What is the meaning of the carvings? When were they erected? All is vague. We were told that a number of bodies had been found which had been carbon dated at between the 12th and 14th centuries. All appeared to have been warriors killed in battle. The layout of the stones certainly gives the impression of a row of head stones and graves beyond them. Many are carved with what are clearly swords but other motifs are less clear – a suggestion for a commonly occurring “fountain-like” shape is that it is a “false banana” tree – a significant plant in the drier areas of Ethiopia, providing all year round flour and leaves for houses etc. One flat stone is carved with a figure but there are no others, no script and no recognisable religious symbols from either Christianity or Islam (the 2 main religions of the region across the relevant period). If you have a spare day in Addis and transport (you might just about make it return in a day on public transport on the road to Butajira but I wouldn’t bank on it) it is worth taking in this WHS (there is also a nice early hominid site and excellent new museum a few kms earlier at Melka Kunture). But the “fame” of inscription appears to have had little effect in the small village of Tiya nor on the site itself which just has a hut with a couple of guards also no doubt guarding each other for the entrance fees (30 birr for foreigners)! The prospects all around are totally rural and the site itself is covered by long grass. There are no signs and no literature. And almost no visitors! Indeed one suspects that, if the site were proposed today, it would probably not get past the ever tougher inspections of ICOMOS. Interesting certainly, but of more than local/regional significance? Unlikely? In 1980 the barrier was much lower and this was 1 of 4 Ethiopian sites inscribed that year. Nevertheless we enjoyed both the visit and the drive to and from. Stelae: Has 36 standing stones or stelae, "32 of which are engraved with enigmatic symbols, notably swords,"